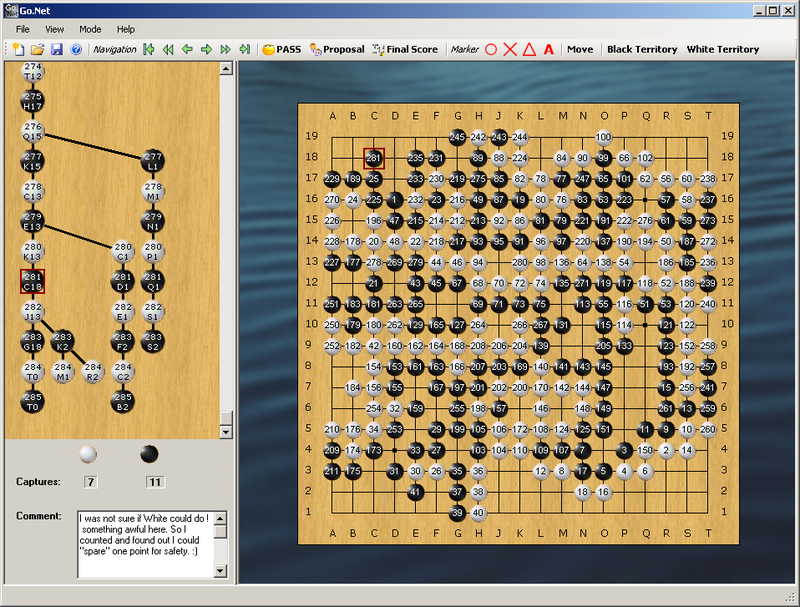 With this Go-Editor you can play Go against a human or computer opponent, replay a recorded game and load/save SGF-files. The application was implemented with the help of Coco/R (generation of scanner and parser for the SGF format). During runtime it uses GNU Go to process the moves (validity check, remove of captured stones etc.) or to play against you. To get this application run, you need an executable binary of GNU Go which you can download here (version 3.6 works fine). Please rename the binary to Gnugo.exe and place it into the same directory where GoNet.exe is located. Of course you need an installed .NET Framework from Microsoft (version 2.0 at least). You can download the executable and the sources in C#. Contributors will find comments to the sources in Readme.Go.NET.txt (in German) which you find in sources.zip.